Eddy Merckx (above) won three editions of "l'Enfer du Nord", the first in 1968, the second in 1970 and then again in 1973. On his left is "Mister Paris-Roubaix" - Roger de Vlaeminck and to his right can be seen Francesco Moser who won the race three years running in 1978/79/80. Paris-Roubaix was first run in 1896. This epic race appears, on paper, to have no major obstacles, as the bulk of the route is flat. However, since it's inception to the modern day it is the stretches of pave, cobbled roads that run through the fields of this agricultural region, that provide the riders with their greatest challenge. It is referred to by many as l'Enfer du Nord - the Hell of the North. Today Paris-Roubaix ranks only behind the Tour de France in terms of media profile and notoriety, this throwback to a bygone era catches the imagination of the public at large. In recent years, however, the prestige of the race amongst the riders has slipped, to the point now where no overall contender for the Tour de France would dare risk injury on the treacherous cobbles of northern France. This is a shame, the list of past winners is littered with names that have also won the Tour, and this lack of involvement of some of the sport's top names undoubtedly devalues the race in the eyes of many. Conversely, some of the recent editions of the race have seen some epic rides, most notably Tchmil's solo win in 1994 and Ballerini's act of revenge, detailed below, in 1995. The race itself has a long and glittering history and a list of heroic stories that could easily stretch along the length of the route itself. Below are the accounts of just a handful of great rides, a few of many that characterise this historic race. Roger Lapebie won the 1934 Paris-Roubaix but you won't find his name in any of the record books. The 1937 Tour de France winner was in pursuit of the leaders, 1932 winner Gaston Rebry and his fellow Belgian, Jean Wauters, when he punctured. Advised that the team cars were stuck miles behind, Lapebie grabbed a woman's bicycle that lay at the side of the road and resumed his pursuit. A few kilometres up the road, he spied a racing bike lying in a ditch and swapped again. Onwards he rode, gradually closing the gap on the two Belgians, finally catching them with around a hundred metres to go. Caught by surprise neither Rebry or Wauters were able to respond and Lapebie won. However, one of the rules of racing back then stated that no changing of bicycle was permitted and, once this rule was invoked, the result was overturned and Rebry was awarded the victory. He would complete a hat trick of wins the following year. Rik Van Looy (left) was unrivaled as a roadman sprinter and his classic wining career spanned 21 years. Like Eddy Merckx he won Paris-Roubaix three times - 1961, 1962 and 1965. He came second twice - in 1963 and 1967. Before Merckx came along nobody had won more classics than Van Looy who as well as taming the cobbles of northern France also won 11 six day races. In the long and glorious history of Paris-Roubaix, 1950 stands out as one of the supreme races, when one of the true greats of cycling produced a ride of exceptional quality. 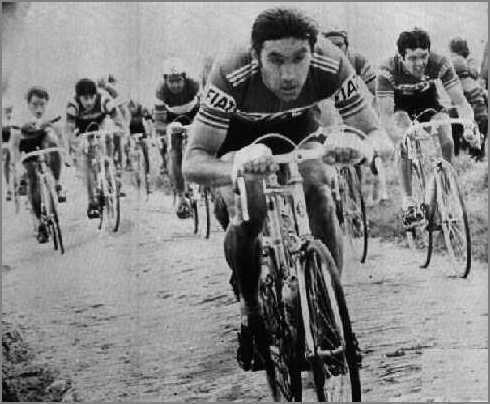 The previous year had seen a tie between Andre Mahe and Serse Coppi, brother of Fausto. This race had not been of great quality and Fausto Coppi was roundly criticised in the press. He vowed afterwards to never race in France again but four months later was winning his first Tour de France. At the start line of the 1950 Paris-Roubaix, Coppi was out to right a perceived wrong. Coppi's plan was simple, isolate the favourites and then stretch them to breaking point. On the Cote de Doullens he forced the pace and split the peloton, only the strongest remained. As they approached the feed at Arras, Coppi's domestic, Conti, transferred the extra food he'd been carrying to Coppi. Noticing this two riders broke clear, Maurice Diot and Gino Sciardis, and arrived at the feed with a small advantage. This mattered not to Coppi, who attacked with great conviction just before the feed and rode straight through, causing panic behind. 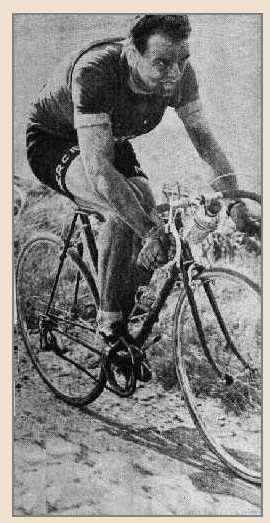 Fiorenzi Magni, a true hard man, was the first to react and a small chasing group, containing Louison Bobet and Rik Van Steenbergen amongst others, formed around the Italian. Up ahead Coppi caught Diot and Sciardis after a five kilometre pursuit. The chase group was just two hundred metres behind. With forty-five kilometres to go, on a section into the wind, Coppi attacked again. This time no-one could stay with him and he gradually eased away from a group containing some of the finest riders of the time. By the time he reached the velodrome at Roubaix, Coppi was three minutes clear of Diot, some six minutes of Magni, who'd won the Tour of Flanders a week before, and a massive nine minutes ahead of Van Steenbergen. French journalist Pierre Chany wrote in l'Equipe the following day, "For 20 years I have watched the greatest champions break themselves here like ships on a reef. I have seen riders with the most graceful pedalling action reduced to mere tool grinding...but yesterday against elite roadmen of his era...Fausto was sublime." The soubriquet, Il campionissimo, was rarely more apt. "Mister Paris-Roubaix" is the title quite rightly bestowed on Belgian Roger de Vlaeminck (right). 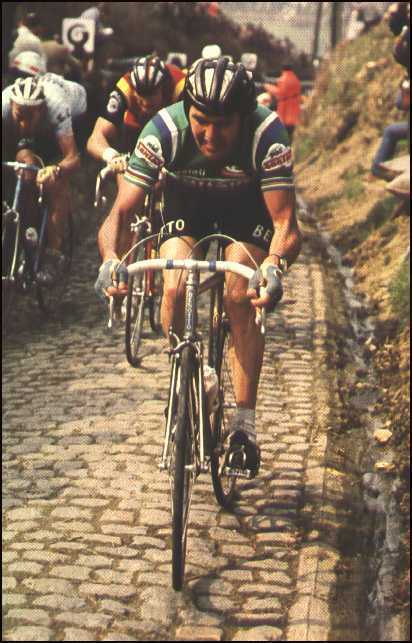 De Vlaeminck first won the race in 1972 having come second two years earlier. He won again in 1974 and 1975 only to be "robbed" of a unique fourth victory in 1976 when winner Marc de Meyer who had done no work in the winning break swept, past him on the Roubaix track relegating a disgusted de Vlaeminck to third behind Francesco Moser. 1977 saw the last of de Vlaeminck's wins in the Hell Of The North and the magical fourth victory - a quite formidable achievement which looks sets to stay in the record books for many years to come. A prolific winner, de Vlaeminck also recorded wins in just about every classic in the calendar including Milan - San Remo (1973), Tour of Flanders (1977), Fleche Wallonne (1971), Liege-Bastogne-Liege (1970) and the Tour of Lombardy (1974 and 1976). His first classic win came in 1969 in Het Volk (then a "minor" classic). A true all-rounder won the Belgian Madison Championship in 1972 (with Patrick Sercu) and was the World Cyclo-Cross champion in 1968 and 1975. In the space of nine weeks in the spring of 1984, Sean Kelly won twelve races, including Paris-Nice, the Criterium International and the Tour du Pays Basque, and was second at San Remo and in Flanders, yet, on the eve of Paris-Roubaix, l'Equipe ran an article which said if Kelly were to be remembered as a super champion then he had to win Paris-Roubaix. During the early skirmishes Kelly was tempted to attack, to unleash the superb form that he had, but each time he dropped back to his team car to talk with his manager, Jean de Gribaldy, he was told to wait. Finally, with some thirty kilometres still to go Kelly launched his attack, an attack which shattered the lead group. After two kilometres Kelly could see the Belgian rider Rudy Rogiers trying to bridge up to him. Rather than risking having Rogiers organising a serious pursuit behind Kelly waited for him. Once he was alongside Kelly upped the pace, quickly passing and dropping Gregor Braun and Alain Bondue, and riding the final twenty kilometres to Roubaix at breathtaking speed. Once onto the velodrome Rogiers was duly despatched and Kelly won l'enfer du Nord for the first time. He would return again two years later to win again. To truly understand the 1995 race one has to cast back one's mind two years to 1993, when Franco Ballerini rode everyone off of his wheel bar Duclos-Lasalle and was then horrified when the wily French veteran produced the sprint of his life to beat the Italian. Ballerini vowed never to return. He was back the following year but a series of crashes and punctures meant he was a supporting player to Tchmil's outstanding solo win, ending up with third place. In 1995 he was on the start line but a crash in Ghent-Wevelgem had separated his shoulder and most pundits had written the Italian off, how could anyone with a shoulder injury cope with the pounding of the cobblestones? Ballerini answered in the most convincing manner. The Mapei team controlled the race from the off. Tafi rode clear with a break of three others with around eighty kms to go and behind Ballerini, Museeuw and Bortolami watched and waited. With forty-five kms to Johan Capiot counter-attacked and Ballerini and Bortolami swiftly followed. These two dropped Capiot and bridged up to the front group. Behind, Museeuw, who'd won in Flanders the week before, discouraged any chase. Finally, with thirty-two kms to go, Ballerini launched his attack. With sublime strength and power he rode alone all the way to the famed velodrome in Roubaix, stretching out his advantage as behind Mapei's combined strength sapped at the will of the chasers. As he entered the velodrome, the cheers from the crowd were immense. Here was a rider who, after a lot of bad luck, had finally won the race that mattered most to him. Afterwards he said, "It's the best day of my life. I've had two terrible years. It's easy to say I've forgotten what happened', but it's never really been true. Until today...it was a fantastic moment when I arrived in the velodrome. I didn't really believe I'd won until I heard the crowd."